This week we’ve been in the process of creating and organizing my new office. Jamie, being the organized half of our marriage, told me that if didn’t help go through things, she would have to tackle my old work area and “organize it for me”, which meant that stuff I might need would be trashed. So that was what prompted me to work harder on my new office. First we had to empty the room and paint it. I had to replace the overhead light and move the cable connection from one room to another. The cable move involved me crawling around in the attic; not something I enjoy, but at least I know how to do it myself. Once all that was done, I could move my stuff in, but there was one catch: whatever I moved in to the office Jamie had to approve. I can be some what of a packrat at times. So the day went on with me picking up something to put in to the room and Jamie asking, “Does that really need to go in there?” I’m thankful for her organization skills and her patience with me as I try to keep everything move out of my pack rat ways. We also made a trip to IKEA to pick up some nice boxes (see photo below) to organize supplies. We also came home with a system to reorganize our closet, so I feel a lot of work coming my way. I look at all this cleaning out and organizing as a way to start 2012 off right. 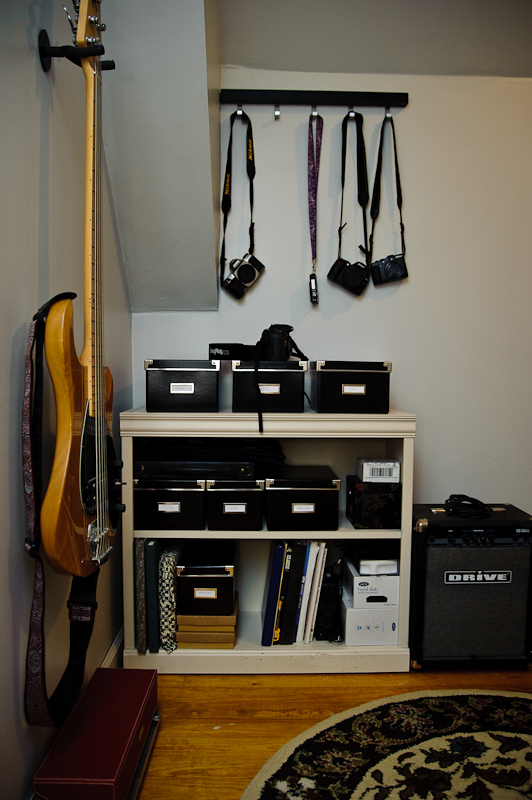 The photo below is what I like to call the photography/music corner of my office. In the old work area, the top of that white bookshelf was cluttered with battery chargers and cameras, but now it’s much better. There I said it, and the first step is admitting I’m a pack rat before I can change. Thank you Jamie for helping me see that I need a little organization in my life.